At SecoTherm we supply our exterior wall coating, SecoFLEX, to trade and professional masonry painters in Telford and surrounding areas. The protective wall coating is suitable for domestic and industrial exteriors in hot and cold climates. There is a network of SecoFLEX Approved Applicators covering the Telford area. SecoFLEX is a coloured masonry coating which leaves buildings with a fresh appearance that will last for many years, reducing the cost of external property maintenance – In fact, we pride ourselves on a 20 year guarantee on our SecoFLEX wall coating! SecoFLEX is also 100% waterproof meaning that it ensures that properties are protected against penetrative damp. Another key benefit which SecoFLEX offers to masonry painters in Telford and surrounding areas is that it is also 400% elastic meaning it can stretch and bridge surface cracks and fissures easily whilst still guaranteeing a flawless finish. Secoflex also protects against blisters and flaking making it superior in comparison to other existing masonry paints. 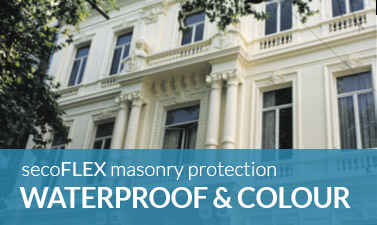 Masonry painters in Telford can see the full specification of SecoFLEX here. If you are a professional masonry painter based in Telford and you would like to gain certification as an Approved Applicator of SecoFLEX exterior wall coatings, please contact us today.